Merlot is a grape from Southern France. 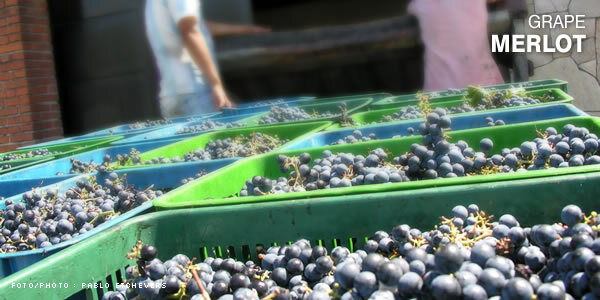 It is generally blended with cabernet sauvignon and tannat. Its combination with tannat has been considered a real discovery and achievement. The Uruguayan specialists have acclimated and moderated the taste and acid of the most popular grape in the country. Merlot manages to grant the right touch of softness to tannat in order to harmonize its sharpness and its hard body, both regarding aspect and aroma. It is possible to discover a taste of fruit in Merlot. Its body features soft shades of violet and it is not too bright. It matures early. Therefore, it is considered a soft wine, ideal to accompany snacks, cheese and cold cuts.